On October 25th and 26th, sixty child nutrition professionals from across the state participated in the first of a series of Team Nutrition Culinary Trainings. The session was held at the Louisiana Culinary Institute (LCI) in Baton Rouge. The training covered: batch cooking, presentation and portioning, baking, recipe production and knife skills. "The Louisiana Culinary Institute was a terrific venue and their chefs provided outstanding hands-on instruction. We will offer additional trainings in 2019." said John Dupre, Director of Nutrition Support, and Louisiana Department of Education. "I learned how to hold a knife the right way!" said Ms. Mathilda Durousseau from St. Landry Parish School Board Child Nutrition Program. 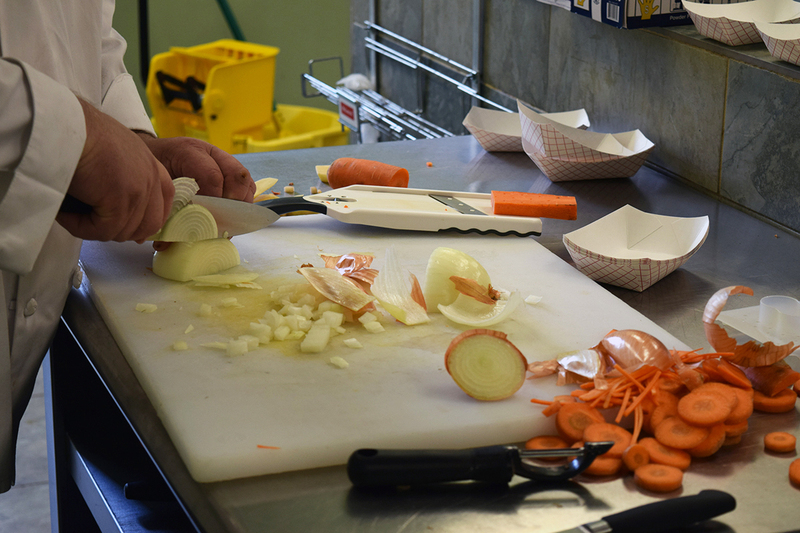 Like Ms. Durousseau, participants mastered "the claw" skill while learning to cut vegetables. Fingers and thumb of the non-knife hand are curled like the claw of a bear. With fingers in this position, there is much less risk of serious injury. If the knife slips, it will only hit against hard fingernails and not the pads of the fingers. Ms. Durousseau said she got so much out of the training from making rolls by hand in the Bake Shop to sautéing broccoli and sweet potatoes in the recipe production class. 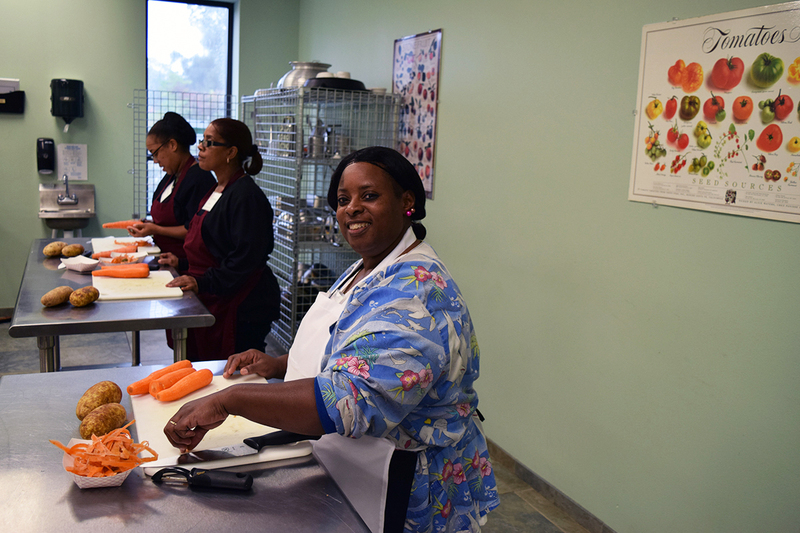 She has put her knife skills to use at home and is sharing her new culinary skills knowledge with her school food service colleagues in St. Landry Parish. Child Nutrition staff were reminded that cooks take pride in the thoroughness and quality of their advance preparation or Mise en Place - the French term meaning "everything put in place." This concept is important in school food service where batch cooking is used to increase efficiency and quality. Most schools in the state have more than three meal services to accommodate all students. Weighing and measuring flour were other important skills participants mastered. All participants had the opportunity to make a dozen rolls using flour and vegetable oil provided by the Louisiana Department of Agriculture and Forestry. Adults and kids alike enjoy the aroma of freshly baked bread! Participants prepared four new recipes from the LSU AgCenter Farm to School Program Harvest of the Month Recipe Box. Recipes included oven roasted broccoli, hot roasted sweet potatoes, simple tomato and cucumber salad and the training favorite—a black bean and sweet potato quesadilla. "We eat with our eyes first! Appearance as well as flavor must be considered when planning new dishes." said Chef Kevin Foil from LCI. While enjoying a tasty lunch prepared by the LCI, participants listened to an inspirational talk from Ms. Linda Green - a well-known New Orleans culinary icon. Before becoming an entrepreneur, Ms. Green worked for the Orleans Parish School Board School Food Service Department. Her words of wisdom resonated with Louisiana Child Nutrition staff members. "I love what I do. I love to cook. Chefs and doctors; we never stop learning." Ms. Green is internationally known as the winner of the Food Network’s Chopped Pride of New Orleans. Team Nutrition is an initiative of the USDA Food and Nutrition Service to support the Child Nutrition Programs through training and technical assistance for food service, nutrition education for children and their caregivers, and school and community support for healthy eating and physical activity. Louisiana’s three-year grant will allow the Louisiana Department of Education and Well-Ahead Louisiana to support healthier school environments that are conducive to healthy eating and physical activity through resources, funding and professional development to schools. Learn more at Louisiana Team Nutrition.